Prior to 1939 Thanksgiving was always celebrated on the fourth Thursday of November, in accordance to President Lincoln’s 1863 Proclamation. President Franklin D. Roosevelt decided to change the date of Thanksgiving at the urging of retailers, who wanted to add more days to the shopping time before Christmas. Since the nation was still in the grips of the Depression in 1939, Roosevelt hoped that the extra shopping days might boost sales and therefore, the economy. However his decision caused mass uproar and controversy. Schools had to reschedule their holidays, calendars needed to be re-printed, even football games needed to be rescheduled. Many people questioned the president's right to change the holiday and stressed the breaking of precedent and disregard for tradition.Thus the “precedent” pilgrim. 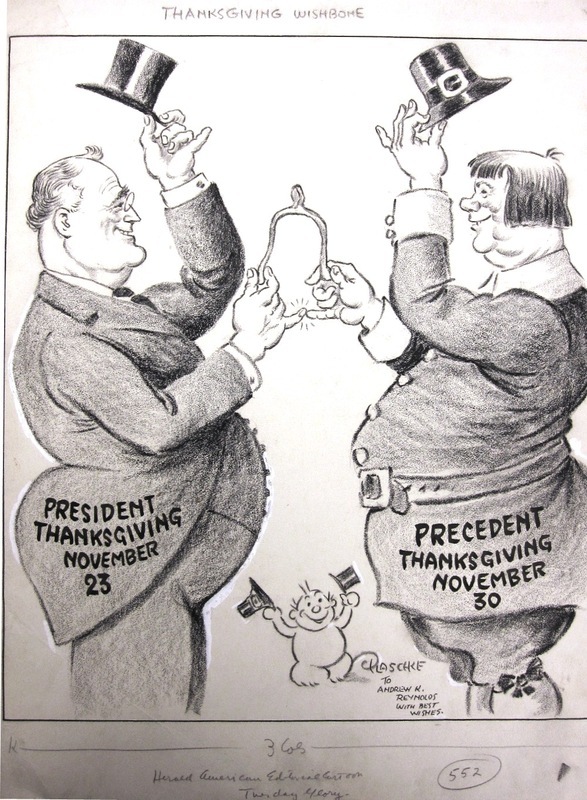 Paul Plaschke, “Thanksgiving Wishbone,” James Monroe Museum Political Cartoons, accessed April 19, 2019, http://jmpolitoons.umwhistory.org/items/show/102.